Dr. Kwadwo Appiagyei Atua, University of Ghana and University of Lincoln. For more information on the Summer School and to register please visit the website at http://www.conference.ie/Conferences/index.asp?Conference=351 or email iccsummerschool@gmail.com. There is no mention of international crimes. The statement seems to be at odds with the position taken by the United Nations Secretary-General that amnesty for international crimes cannot be part of negotiations for a peace agreement to the extent that international crimes are concerned. The final phrase is a legal curiosity, in that it excludes amnesty to those 'found guilty of capital crimes'. The statement provides some confirmation that the statement contemplates more than trivial or insignificant offences associated with occupying building. The idea of finding people guilty suggests that as a preliminary they will be tried , and this seems incompatible with the notion of amnesty, which would normally be raised as an exception to jurisdiction at the start of a trial. Moreover, 'capital crimes' refers to crimes subject to the death penalty. But capital punishment has been abolished in Ukraine. Ukraine is a Party to Protocol No. 13 of the European Convention on Human Rights by which condemnation to the death penalty is prohibited in all circumstances. In other words, the possibility that someone could be found guilty of a capital crime in Ukraine is ruled out by Ukraine’s own treaty obligations. Genocide, crimes against humanity and war crimes are not 'capital crimes' in Ukraine. What on earth did the the EU – all EU members are parties to Protocol No. 13 – think they meant by the phrase ‘found guilty of capital crimes’? Is this just proof of the fact that diplomats will sign almost anything as long as they can get agreement? This Friday in Geneva, the Centre for Humanitarian Dialogue and the Transitional Justice Institute will be presenting the Belfast Guidelines on Amnesty and Accountability to various stakeholders, experts, diplomats and officials in the city. The Belfast Guidelines present a nuanced and sophisticated approach to the issue of post-conflict amnesty and amnesty as a tool to peacemaking. They are about the balancing of competing obligations. They resist the extreme position advocated in some quarters by which amnesty for international crimes is said to be prohibited by international law. Last week’s four-party statement on Ukraine is further evidence of the abundant practice indicating that there is no prohibition under international law of amnesty, even for genocide, crimes against humanity and war crimes. In a dramatic example of judicial activism, a Trial Chamber of the International Criminal Court has issued what will surely be known as the ‘Ruto Subpoena Decision’. It ‘Requires’ the appearance of several witnesses ‘as a matter of obligation’ and ‘Requests the assistance of the Government of Kenya in ensuring the appearance of the witnesses’. The decision is signed by Judges Eboe-Osuji and Fremr. A dissenting opinion is to be filed by Judge Herrera Carbuccia. Until last week’s decision, most specialists on the law of the Court did not think that such authority lay within the Rome Statute or the Rules of Procedure and Evidence. Indeed, there have been frequent criticisms by scholars about the absence of a subpoena power. Some have called for amendment of the Statute in order to repair this gap. The Prosecutor and the defence lawyers seemed to concur, because in almost a decade of judicial activity none had asked the Court to issue a subpoena. Now, it seems, the power was there all along. The judgment relies upon a doctrine of implied powers. It relies on rulings of the International Court of Justice concerning implied powers of the United Nations. The Chamber’s argument might have been more compelling had it referred to implied powers rulings of international criminal tribunals or, at least, international human rights tribunals. There is of course some good authority here. In particular, the decision of the European Court of Human Rights, in Mamatkulov and Askarov v. Turkey, on the binding force of a provisional measures decision would seem to be helpful to the Chamber. The Chamber supports its proposition with reference to the subpoena provisions in the Rules of other international criminal tribunals. In particular in notes such provision in the Rules of the tribunals for Sierra Leone, Lebanon and Cambodia, stating ‘it would require very clear language indeed for the States Parties to the Rome Statute to be taken to have intended that the ICC … should be the only known criminal court in the world (at the international and the national levels) that has no power to subpoena witnesses to appear for testimony’. But the three tribunals in question were created after the Rome Statute. The Chamber's argument works just as well, perhaps better, in the other direction: the drafters of the Rules of those subsequent tribunals made express provision for subpoena power because the Rome Statute suggested that the default position of international law was that no such power lay with an international criminal tribunal. Most observers of the Rome Conference consider that the absence of an express subpoena power in the Statute was quite intentional. Reference might also be made to the Rules of Procedure and Evidence, where there was an opportunity to correct any ‘oversights’. Probably many delegations at the Rome Conference were reacting to an earlier case of judicial activism. In October 1997, eight months before Rome, the Appeals Chamber of the Yugoslavia Tribunal had issued an order against Croatia (the case is known as the Blaškić Subpoena Decision). They were concerned about intrusions into State sovereignty by activist judges, especially when national security information was concerned. The visible result in the Rome Statute can be found in the feeble text of article 72. The invisible result is probably the lack of a power to subpoena witnesses. That explains why article 93 speaks of States facilitating ‘voluntary appearance’ of witnesses but is silent on forcing them by compulsion to appear. Perhaps the reason why the issue has not previously arisen is that parties to cases before the Court never felt the need to force a witness to testify. The significance of compulsion to testify is probably overrated. It is a rare occurrence for counsel to force the testimony of an uncooperative or hostile witness. The results are unpredictable and dangerous. Usually, lawyers require a subpoena in order to overcome a legal or contractual obstacle, such as bank secrecy. The innovation of the Trial Chamber is welcome and exciting. One of the crucial differences between the International Criminal Court and the other international criminal tribunals has been the very complex codification of the law, including the procedural law, applicable to the former. The States that created the Court wanted to make sure they kept a tight grip on its operations. But experience shows that judges find ways to express their creativity, developing the law in unexpected directions. And States are weak, almost powerless, to resist the development of an institution that takes on a life of its own. We can see this phenomenon at the other international criminal tribunals (think of the legendary Tadić Jurisdictional Decision) as well as the international human rights tribunals. It remains to be seen whether Kenya will comply. Should it refuse, the Chamber can complain to the Assembly of States Parties (art. 87(7)). Then the States Parties that, fifteen years ago, almost certainly resisted the idea of a binding subpoena power will be able to reconsider the matter. The prosecution of Ruto (and Kenyatta) has been on shaky ground for some time. Is this the final effort by the prosecution to revive a faltering case? This mosaic consists of the covers of doctoral theses published by graduates of the Irish Centre for Human Rights since the first PhDs were awarded not quite a decade ago. 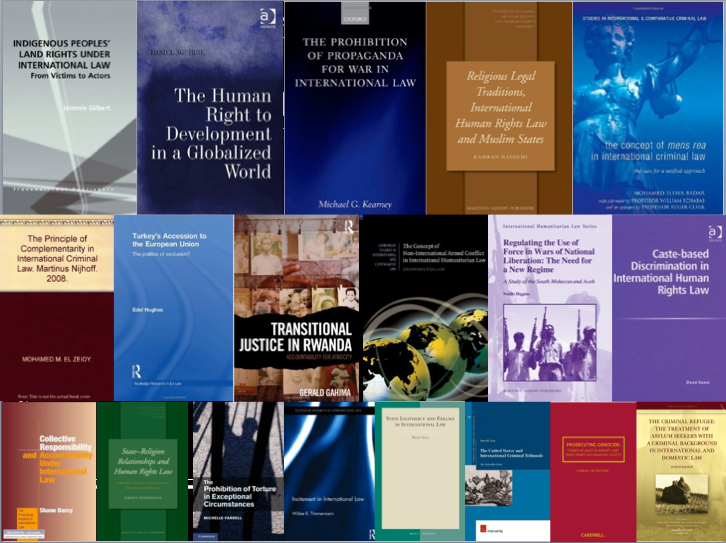 There are 19 of them, with all of the leading legal academic publishers, including Oxford University Press, Cambridge University Press, Martinus Nijhoff, Brill, Routledge and Ashgate. At least three more are forthcoming. Shane Darcy prepared this slide for the annual doctoral seminar at the Irish Centre for Human Rights. One of the consequences of the growth in open access on-line publishing is the proliferation of what have been called ‘predatory publishers’. These are commercial ventures that attempt to attract scholars to publish with them and to attend ‘academic’ conferences. Most academics regularly receive invitations from these operations. Jeffrey Beall has developed a website dedicated to the phenomenon. He provides criteria for assessing whether a publisher is genuine, and keeps a list of dubious publishers. The former Prime Minister of Trinidad and Tobago, Arthur Robinson, has died. Readers may be familiar with his 1989 request to the General Assembly to consider the foundation of an international tribunal to deal with those suspected of trafficking in drugs. His request, and the resulting General Assembly Resolution, spurned the International Law Commission back into action on the formulation of a Statute for the International Criminal Court, a project that had essentially lain dormant for the best part of four decades. President Song of the ICC referred to Mr Robinson as the 'grandfather' of the International Criminal Court. An interesting but little-known fact is that Arthur Robinson was a good friend of Professor Robert Woetzel; the two men studied in Oxford together. Professor Woetzel was the founder of the Foundation for the Establishment of an International Criminal Court, and one of the few academics who continued to advocate for the creation of a permanent international criminal tribunal during international criminal justice's Cold War hiatus. Woetzel died suddenly in 1991, just two years before the creation of the International Criminal Tribunal for the former Yugoslavia and seven years before the International Criminal Court came into existence. It is heartening that his friend lived to see their shared vision finally come to fruition. On 2 April 2014, the State of Palestine notified the Swiss Federal Council, depository of the Geneva Conventions, of its intention to accede to the four Geneva Conventions and Additional Protocol I. The accession of the State of Palestine to the Conventions and Protocol was formally accepted by Switzerland via a letter issued on 10 April. Israel argues that the Geneva Conventions should not apply to the West Bank and Gaza, because no state claimed sovereignty over the territory. This position was rejected by the International Court of Justice, stating that Section III of the Fourth Geneva Convention 'which concerns “Military authority over the territory of the hostile State”, is particularly pertinent in the present case.' Similarly, UN Security Council Resolutions have consistently called upon Israel to apply the Fourth Geneva Convention in Palestine. The Israeli position, while already on very dubious legal grounds, has become even more difficult to justify with this latest development. The Secretary-General of the United Nations circulated notifications regarding the State of Palestine's accession to 14 other treaties on 9 April. The notification regarding the Genocide Convention can be found here. Thanks to Evelyne Schmid and Yousef N. Zeidan.